A few weeks ago I decided to tell you a bit about my fitness experience, and I touched briefly the topic of “eating well”. I want to explore it a little bit more today, because I’ve been thinking about it a lot recently and I’m interested in hearing your thoughts too. The first thing that springs to mind as soon as I hear the world diet it’s that “It’s not a diet, it’s a lifestyle”. I think it’s a key point when talking about our relationship with food, but it’s not as easy as it seems. The main problem that I have and I see in other people too it’s the fact that most of the time the reason we don’t eat how we should is because eating what we like without really thinking it’s more convenient. If I come home at half past eight pm I can’t really be bothered to cook something that takes time, and some pasta that cooks itself while I quickly shower is the first thing that comes to mind. The problem is that, for me, it’s the most damaging thing I can do, because such a high carb load at night simply makes me gain weight. We also eat out of habit, and it’s a thing that’s so hard to change. When you try to explain to someone that eats a full meal of three or more courses two times a day regardless of their activity level, if it’s the way they’ve always lived it takes so, so much to even make them understand. Then there’s the problem of all the “diets”. From magazines, to books and online pages there’s so much information that’s really hard to see what’s right for us and what’s not. If you simply rely on globally “approved” guidelines, you may only learn that you need to eat carbs (a lot), extra virgin olive oil, fruit and vegetables, meat a few times a week… But it’s not really that simple. For someone that sits at a desk all day that recommended amount of carbs is too much, but it’s only an example. An then there’s all the “diets”. They work? They don’t? They even have the ability do cause damage? Well, some are pretty crazy. And often they’re unbalanced and pretty hard to follow. But they’re not always straight bad: for example, a month of well done Dukan Diet wouldn’t kill anyone (if your kidneys are fine, but I hope so), but maybe a lifetime of daily doughnuts would. But if you don’t even read the books and eat only meat (and maybe even only processed products, not natural chicken breasts and eggs) for two months you’re pretty much an idiot, sorry (and I know one unfortunately). What always makes me think when I hear someone criticize “diets” is that they always compare them to “eating right”, which is a undefined concept. Are you sure that a diet that eliminates gluten (even if it’s not required by celiac disease or gluten sensivity) it’s more damaging than a totally unbalanced one made of daily pizza delivery? Are you sure that eating meat daily is worse than eating sweets or drinking alcohol on regular three-nights out weekends? I’m really not. If you need to follow that magazine diet (that at least should be reasonably balanced as long as it doesn’t claim to make you lose 10 pounds in two days by eating air, but that’s your problem to discriminate) to avoid eating crap then that’s great. Sorry, but it’s really what I think. What we do after thinking about all of this is another story though. I know what works for myself (pretty much a paleo diet, even if not strict, with the saturday night pizza and sunday cake), but I regularly screw it up, to be honest. Since my last post, I’ve been eating pretty well (and most importantly I haven’t eaten at random times of the day without even thinking about it), but any excuse to be guilty has been welcome. A week of ice cream after a wisdom teeth removal? Oh yes! A bowl full of pasta because there’s broccoli in it? Yes! The result? I’ve not gained weight, but it’s the same and it’s not what I want… Luckily the gym’s been going well! Whoa, it’s not even half of what I have to say but I think it’s enough for now. Let me know what you think and what you do, I can’t wait to hear your thoughts! Oh I so agree, I really don't believe in dieting, I believe in adopting a healthy lifestyle. Diets are just temporary but a lifestyle is forever. Hey Gyudy, I think we all need to find the way of eating that works for us. I for one, gain weight with an excessive amount of protein, but I'm quite safe when it comes to carbs. I know a lot of doctors and nutrition specialists would disagree, but several years ago I was living with Belgian family, so I was eating more protein than what my body could handle. I was constantly having stomachaches, and I gained a lot of weight that I couldn't lose. Now I eat what I want to eat, which is quite some carbs but at least it doesn't make me sick, and I no longer carry extra weight! I don't believe in dieting either. I love working out 5 days a week and eating really healthily! What a great post, Gyudy! “It’s not a diet, it’s a lifestyle”-is brilliant. I believe in eating anything in right amount and starving is something I hate. I found this a fascinating post! It's so true it is a lifestyle change but we are all creatures of habits. For change to happen it takes time. I'm joining the gym next week - and can I tell you I'm frightened?! But I know it's something I'm going to have to keep at. Also - I always end up being tempted by chocolate, I know everyone says moderation etc but sometimes I scoff down way too much and sometimes I have none haha! Great post! 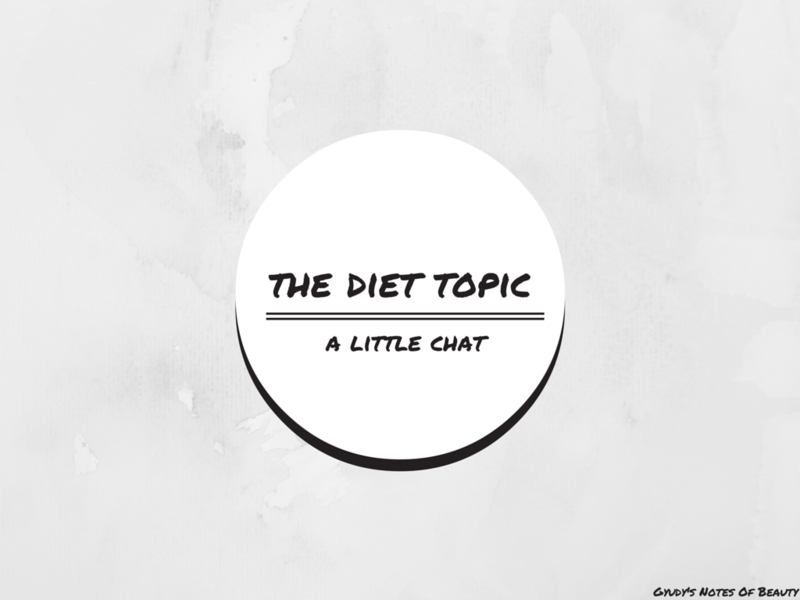 I agree that we get caught up in all of the extreme diets and don't think realistically. Highly restrictive diets are not sustainable. Everything in moderation! I have the same experience as Sunny. Too much meat makes me gain weight whereas carbs don't. I used to be a vegetarian and that's when I was at my lowest weight - and I ate a ton rice, pasta, bread etc all of the time. When I started eating meat again that's when I gained weight. My boyfriend and I tried Atkins once (for a short period). He lost weight, I gained. We are all different. I'm still struggling to find what works for me but my greatest challenge is getting enough exercise. Ugh I tried something like Atkins once (I didn't cut the fruit and vegetables out), and I was SO miserable and SO sick. Never again. Thank you, I'm so so glad you liked it so much! I find it so easy to fall into old wrong habits, so I really feel that part of the post... I always have to remember me that I'm not going to do myself any favor doing that!